Mt. Pisgah Benevolent Cemetery, Romney, WV. Mt. Pisgah Benevolent Cemetery is located on the north side of US Rt. 50 just west of the town limits of Romney, West Virginia and the entrance to Indian Mound Cemetery. It sits on the edge of U.S. Rt. 50 below Indian Mound Cemetery in the bend of the old, abandoned Northwest Turnpike curve. Listed below are the names on existing stones and markers. We would appreciate some assistance in obtaining all names for this important African American cemetery. The back has some field stones with no markings. What is now called the Mt. Pisgah Cemetery was not always named that or located where we know it today. Apparently, the original deed to the property was never recorded; however, one can find mention of that land transfer in Deed Book 56, page 166, May, 1872. This deed concerns land transfered from John Heiskell, Special Commissioner, of the First Part, and James Wirgman and Octavius Wirgman, of the Second part. The property was a 326 acre tract of Gibson, then deceased, in the area of lands of Indian Mound Cemetery and the farm presently called "Sycamore Dale." 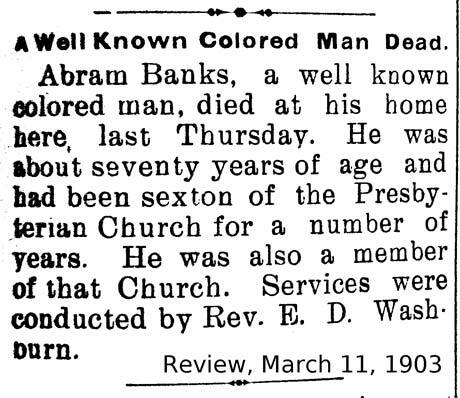 The cemetery is mentioned as such: "...excepted about one acre, lying in the bend of the N. W. Turnpike Road on Town Hill just below the Indian Mound Cemetery which one acre has been sold to the Colored Benevolent Association for a cemetery." Some information on the Colored Benevolent Association can be found in notes from a speech given on the Association's 53rd Anniversary, July 30, 1920: "The Benevolent Society of Romney, West Virginia was organzied by Daniel Banks on Jan. 1, 1867 in the Courthouse with a membership of 50 people; only three people and the present president now survive." Alfred Whiting was the first President; sometimes membership was up to 80. Further research reveals notes of the meeting concerning the moving(?) of the cemetery to allow for the straightening of Rt 50: July 10, 1934, it was agreed to give the original land to the State Road Commission (SRC). (It seems that the following was what the SRC would pay to the Association for the original land and the move) Lots = $10, single grave $3; $75 for damages done; a fence to be provided by SRC; the old road to be given to the C.B.S. A search of courthouse records has not yet turned up any document verifying the establishment of the Association. It appears that just following the Civil War no one cared to file papers for a colored organization. Furthermore, a query to the Division of Highways has not turned up any documents verifying the agreement connected with the land transfer in 1934. We assume that the Division of Highways was probably faced with the fact that the Colored Benevolent Association no longer existed making it difficult to do any deed transfer. It is uncertain how much land the cemetery had to give up to the highway. It appears that the cemetery lost some land and gained only the old road bed. However, no records exist of the original layout. It is not clear if graves had to be moved. Colored Benevolent Cemetery, Romney, W. Va. Note: Be advised that this is a draft list and may contain errors; we are soliciting assistance in completing this important project. Alfred Whiting, age 98 years, Jan. 1, 1824 - March 6, 1922. Source: Obituary in the Hampshire Review of March 8, 1922 Mr. Whitings death certificate lists that he is buried "in Romney." 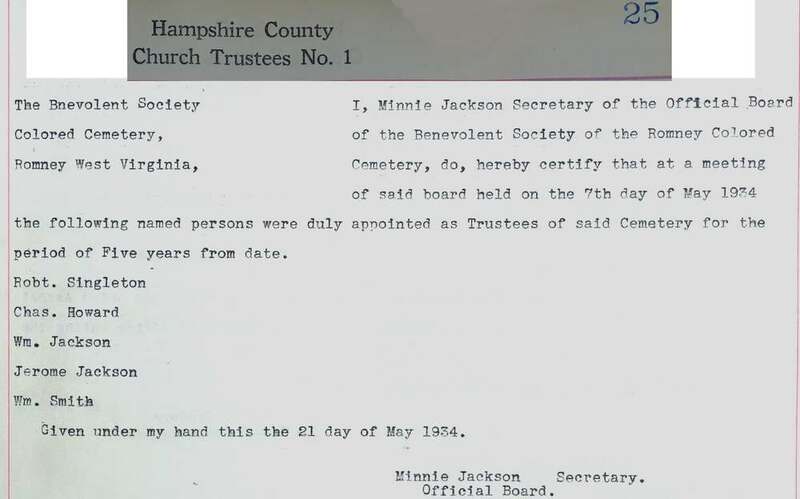 The following names are taken from Hampshire County Death Records (1866-1922)*, compiled by Vicki Bidinger Horton; printed by The Hampshire Review, Romney, West Virginia, 1993 and are listed therein as "bur. in Romney." We can not be sure which cemetery they were buried in because we know of at least one other African-American cemetery in Romney, Armstrong Cemetery which was probably used from around the Civil War to sometime before 1927. We assume some of the names below are buried in Mt.Pisgah Cemetery. The following names are taken from Undertaker/Funeral Home records. The following names were supplied by Jane Ailes from death certificates. This is an ongoing project. Please contact us if you have information on this cemetery - people buried here or the deeding of the cemetery and the establishment of the Colored Benevolent Association. Contact us through the contact page on this site or call Charles Hall (304)496-7218. We need your help.